So, when I was thinking about what I would post today, I went looking for something from my artistic past. And as I went through the photos I have taken of my art, past and present, my scrolling finger happened upon this one. This is what I was looking for anyway and I knew it should be posted today for a number of reasons. First, I had mentioned Heart Mountain (before the vineyards were planted) in a previous blog and thought you should see nature’s perfect heart shape made up completely of my beloved oak trees. I am still enchanted with the simplicity and the all too human naming of something that grew naturally into such a shape. (The other day I almost began to weep with joy when I saw a picture on the side of huge grocery truck that showed two hands facing outward heaped with bright red cherry tomatoes in the shape of a giant heart. Not really the same, I guess. But it did take my breath away.) Second, it’s my son’s birthday is tomorrow and he was my sunflower baby. And I love me some sunflowers one by one or in glorious drifts as I saw outside the parking structures of the Stanford Shopping Center when I was pregnant with my son. I should add that there never were such flowers in the foreground of Heart Mountain. The day I ran across the road from Sycamore Farms (July 2003) and took this picture there were lots of weeds in the foreground—mostly thistles. Finally, I knew I would post this one because of the color palette and texture I had achieved with this landscape. I remember being obsessed with my process of layering in the colors that made up the subtle palette of yellows, golds, soft greens and grays with that beautiful pristine blue sky and emerald green heart-shaped jewel in the center of everything. I knew I would post this one because in the more than 10 years since I scrubbed in the watercolor and colored pencil on the lovely cold pressed illustration board, my art and my approach to it has changed in a rather unexpected way. I had come from a place of oil on canvas landscapes and watercolor and Prismacolor colored pencils on illustration board, where every inch of the surface I was working on was accounted for—no white spaces and nothing left to chance. Now, I find myself looking for places to randomly sketch or paint a view that has caught my attention. (I probably would have painted the heart-shaped hands of cherry tomatoes that was on the side of that truck if I had had the time…) And I have even taken photos of a finished sketch where I have intentionally let the actual light and shadows cast on the paper as I sit on a bench or on my rolled out sheet of bubble wrap on the ground. Those momentary moments make me smile outwardly, giggle inside and “yes” sometimes take my breath away. Since I started doing looser “on the spot” painting and sketching (the hallmark of a committed urban sketcher) I have really let myself go—but in a good way, I think. Now I work a bit more wet, letting colors bleed together as they do without any encouragement. I intentionally leave white spaces as highlights or negative space that adds interest to an otherwise boring flat 2-D surface. I like to go really dark in some places and try to feather the perimeter of that spot with soft colors for an interesting effect of shrubbery or trees. But I don’t mind the hard edges of one color next to another, which would have made me anxious before. I also try adding a color that I am almost certain won’t work, just to see what will happen. And I really enjoy being in the moment—sitting at a cemetery, garden bench or at my breakfast table looking out my window, instead of sitting inside and working from a photo. (I think I said in a previous post that when my son was young, I didn’t have the time or opportunity to paint plein aire. So, I had to paint from photos that I could take at a moment’s notice and then work on my art at home when I had a free 30 minutes or so…) Now, I don’t regret the time I spent in my studio painting on canvas or a piece of illustration board from photos while listening to Miles or Mozart. (I even had special light bulbs in that room that mimicked sunlight. I think it was called a full spectrum light.) That was heavenly! But I have found a new spot of heaven to dwell in these days and it’s almost always outside now. As I looked at the picture I took of Heart Mountain the summer 2003, I tried to remember not only the artistic journey I had taken to get this place, but also how my life had changed in the 10 plus years since I’d taken it. 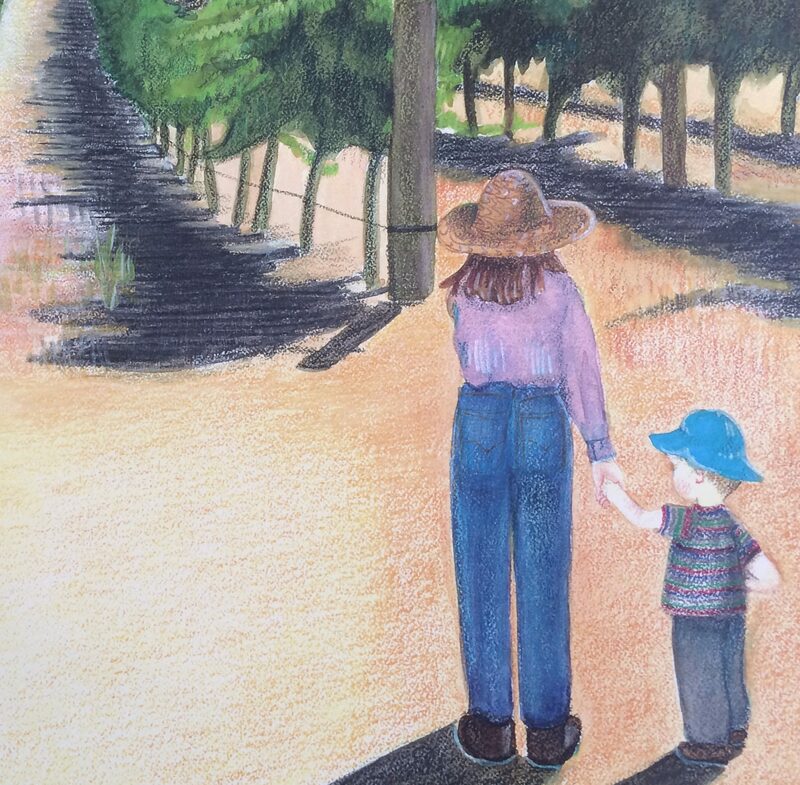 In the early 2000s my son and I were living in Paso Robles and I was doing freelance writing/editing for a number of educational publishing companies that were mostly here in California. During that time I also wrote and edited some gardening books for Sunset Gardening—they were in Menlo Park. Then we moved to Grass Valley the summer of 2003 (there’s that time again…). But I missed my beautiful oaks and vineyards of Paso Robles and I continued to do art from photos of the area. And I was still painting Paso landscapes from photos in Grass Valley in 2006. Crazy huh? Between then and 2015 (when I moved to Southern CA) I continued to paint, but was not so obsessed with painting Paso Robles or San Luis Obispo County for that matter. Soon after I got to SoCal my son and I were walking around Brand Park in Glendale and I saw a bunch of artists sketching and painting like mad in the Whispering Pine Teahouse and Garden. When I asked one of the artists what was going on, she directed me to the woman who was leading the group. And the rest is history. She invited me to come to one of their group outings at the Norton Simon and I was hooked. No more nostalgia for the hills and blue skies of Paso Robles. No more thoughts of painting San Luis Obispo County. It was to be my time of sketching and painting in the moment in the beautiful Southern CA. Right? Oops! I guess One California Girl just couldn’t help herself—still in love after all these years.